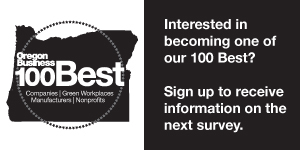 Welcome to the 2019 100 Best Companies to Work For in Oregon list. Now in its 26th year, our annual roster showcases businesses with the most satisfied employees. The list remains a popular beauty parade with serious overtones; these companies have found winning formulas for creating happy workforces, an increasingly useful tool in today’s competitive labor market. The following list gives brief descriptions of each of the 100 Best Companies’ workplace attributes, which paint a picture of the reasons these businesses made this year’s list. Look for recurring themes of flexibility, open-door policies and family-feel work environments. Congratulations to all those companies that listened to their employees and became a 100 Best workplace this year. Employees here praise a smart management team that leads by example. The workday is full of flexibility and variety. Employees thrive in a positive, family-style work environment with “limitless” potential for personal growth. They value the company’s philanthropic programs and have a sense of giving back to the community. Staffers enjoy a family-oriented and collaborative work environment at this construction company. The firm offers excellent benefits, including scholarships. Employees are focused on improving the community and tackling a diverse and challenging portfolio of projects. T-Mobile's Salem call center features an on-site community garden, cafe, gym and yoga classes. Managers create a culture that is open and responsive to feedback. Employees have a wealth of opportunities for professional development and advancement: The company even paid for one employee’s bachelor’s degree. Employees at this credit union enjoy excellent medical benefits, retirement savings and competitive wages. A cooperative ownership structure ensures the team puts values over profits. There is a culture of investing in training and development for employees. In the fast-moving work environment at this startup, employees enjoy freedom and independence. Management trusts employees to make decisions and take time off when they need. Profit sharing and telecommuting benefits are a plus. “Trust in the leadership to listen and make course corrections as needed,” sums up a staffer. A top-notch benefits package at this software company includes paid sabbaticals, generous paid time off and company outings. It shows commitment to the community by paying employees up to four hours a month to volunteer at nonprofits. This commercial landscaper spares no expense for its employees with flexible hours, remote work options, financial and tax planning, and paid trainings. Employees, who call themselves “Team Orange,” benefit from a highly collaborative and positive culture. This financial security firm offers opportunities as a growing company with a management team that gets positive marks from employees. A brand-new headquarters, casual work environment and work-life balance add to employee satisfaction. Employees describe the leadership at this company as innovative and caring. They add to the employee experience with touches like gifts for weddings/babies, flowers for lost family members and a “great open-door policy.” All employees feel valued in an environment that is more collaborative than hierarchical. Opportunities for growth abound at this innovative contractor. Management advances core values of integrity and respect. As one employee puts it, “from top management down to the lowest guy on the totem pole, everyone is treated the same.” The values-driven approach inspires fair business practices and community involvement. This contractor’s motto, “the strongest foundations are built on trust,” extends to the way it treats its employees. The leadership provides ample training and support to new hires and old hands alike. On top of that, employees say they earn competitive pay and have opportunities for advancement. With a true open-door policy, employees say, managers at this worker-owned contractor are willing to try out new technologies and ideas. The culture is defined by an openness to new input from employees, and management is supportive of union involvement. This contractor rewards employees with excellent starting pay, team-building opportunities and generous health benefits that include a free gym membership. Managers encourage employees to take time off, even in the midst of a frantic period of construction. It makes sense that this medical device retailer prioritizes health with free gym memberships and a wellness program. The company also offers flexible hours and generous vacation time. “You can be open and express your thoughts and feelings about what is going on,” says a staffer. One employee’s extended checklist of benefits at this human resources consulting firm includes “dogs, babies, sustainable practices, incredible parties, employee appreciation weeks (Spring Break, woo! ), beautiful artwork, and incredible and funny coworkers.” Employees all pitch in to ensure the company meets its certified Benefit Corporation standards. This law firm boosts morale with a full schedule of events, including a skydive wind tunnel, baseball games, company lunches and dinners, in-house happy hours, tastings at local wineries, and personal trivia games to welcome new hires. The firm makes volunteering at local charities a priority. Employees see transparency and communication in the leadership at this third-generation, family-owned business. One employee values that the “owners spend time taking the employees to lunch for discussions on work, family and life.” Other strengths, employees say, include good pay, reasonable hours and a team-oriented environment. Employees at this consulting firm are rewarded with a high 401(k) match of 7%, generous paid time off and bonuses. They can recharge at the company’s farm in the Columbia River Gorge or on its boat and kayaks. Schedules are flexible. Remote work is encouraged and advancement is ensured through on-site training. Employees at this pharmaceutical manufacturer enjoy great pay, benefits, profit sharing and year-end bonuses. The company keeps a wellness team on hand to advise employees about healthy lifestyles, and a talent management team helps with career planning. Those seeking to move up through the company find plentiful opportunities and funding for further education. Employees express an excitement to work at a company with a mission to make taxes more transparent for people. “It is a rocket ship,” one employee says, “already the best in class in its industry.” Employees describe the leadership at this company as caring and supportive. At this business management consulting firm, employees feel engaged and passionate. Self-direction and employee input are encouraged. “You can choose your own adventure,” says one employee. “Whatever initiative you think is important, you can lead it.” Staffers describe the leadership as trustworthy and transparent. This construction firm is a tight-knit crew. Employees appreciate the emphasis on safety and support for those with injuries. The company offers performance-based bonuses based on the success of projects, creating an atmosphere of collaboration. This member-based consumer finance company keeps up a positive and casual work environment. Managers foster transparent communications about strategy and operations. They also keep the mood light with office pingpong and a mini-golf tournament. This insurer emphasizes personal growth and spending time with family. One employee says the company never fails to “accommodate our social and family needs above our work demands.” The company creates a positive atmosphere with parties, team-building and contributions to the community. Employees feel challenged by the variety of values-driven projects at this digital product design agency. A flat leadership structure inspires collaboration. Perks include food, outings, gatherings and Q&As with prominent guests. Employees are chosen not only for skill, but for holding the shared values of the company. This employee-owned construction company encourages staffers to get involved in community life by making each employee a member of a professional or community organization. Staffers can donate time and resources to charities during company time. A focus on employee training and growth keeps workers happy. Managers are hands-on at this Lake Oswego financial advisory firm where employees receive coaching, and training. Social events throughout the year help employees bond with each other. “Focus is on personal goals and achievement in life, not just business,” sums up one employee. Work-life balance is a focus at this commercial real estate company, where employees can work flexible hours. A focus on teamwork and collaboration keeps employees committed. Staffers appreciate that executives are transparent and share decision-making with workers. Career development is an emphasis at this Portland data and analytics firm. The company provides a stipend to employees who want to continue developing their skills. Regular team building events — such as wine tasting, go-kart racing and zip lining — help employees connect on a personal level. This law firm touts its efforts to improve work-life balance in a sector known for long hours. Employees feel their voices are heard. Good health and retirement benefits make staffers feel valued. “Great support staff and management makes the firm a great place to work,” says one employee. Employees love the community-minded ethic at this family-owned furniture and bedding store in Central Point. Furniture donations to organizations in need and food drives are part of the company’s community work. Staffers love the opportunities to grow, try out new positions and be promoted. Tuition reimbursement is a welcome perk, too. Year-end profit-sharing, cellular program discounts and paid days off for community volunteer work are some of the benefits at this commercial real estate firm. Weekly yoga classes, kegerator, snacks and a fancy coffee machine in a newly remodeled Portland downtown office aren’t bad, either. The list of benefits at this environmental consultant reads like millennial workplace heaven: monthly in-office massage sessions, weekly group sessions with personal trainer, kegs of beer and cold brew coffee on tap, lunchtime foosball and pingpong, and yes, hammocks. Profit sharing and flat hierarchy make this a top company to work for. This management consultant startup shuns hierarchy. Everyone’s voice matters no matter how long they have been with the company. “Diversity and inclusion is very important to everyone, and there is real initiative to be more inclusive from leadership down,” says one employee. “I feel heard, recognized and valued,” says another. This staffing firm prides itself on offering generous benefits, such as a maximum 41 days paid time off and employer-paid TriMet passes to employees using public transportation to commute. A culture of encouraging employees to balance family time with work is key to employees’ satisfaction. This pet-friendly environmental consultant is all about promoting a healthy workforce. Standing desks, healthy refreshments and allowing employees to take extended lunches for working out are some of the benefits on offer. A pool table, foosball table and pingpong help staffers burn off stress. Involving employees in company strategy is part of the culture at this Tigard building-repair company. The firm holds several outings a year with employees, including camping and fishing trips. Managers include staffers in decision-making. Healthy snacks, free uniforms, tuition allowance and sabbaticals round out the perks. Small gestures, such as flowers on birthdays and anniversaries, keep employees happy at this employee benefits consultant. Periodic on-site massages and stand-up desks are welcome benefits. Flexible hours and a culture that supports work-life balance keep employees loyal and dedicated. Flexibility is the name of the game at this environmental consultant. Employees choose their own schedules, enabling staffers to participate in children’s events, take long weekends or deal with personal items. The company offers six months of unpaid leave for any reason with job security. All employees have the chance to earn a five-night tropical vacation for hitting the annual sales goal. The “ICON University” offers coaching and training on a variety of topics, including goal setting, habit forming and money management. Free food and an IPA rotating tap are not bad, either. A kitchen stocked with snacks and fruit, Friday happy hour and a summer barbecue are part of working at this commercial real estate developer. Quarterly team-building events keep staffers engaged. “They take care of their employees, whether it be pay, flexibility in schedule or benefits,” says a satisfied employee. Job training is an important part of the culture at this employee-owned general contractor. Workers can learn specific skills through a teaching program. A company retreat to Maui went down well with staffers. An employee-built lounge with TV, on-site gym and overnight retreats to celebrate successes are part of the appeal. Employees get free pints of Bliss ice cream as a perk of working for this food manufacturer. A company chef cooks organic meals for staff for a small fee. Volunteerism runs big: Staffers can volunteer during work hours as well as in their own time, and receive bonuses for doing so. This accounting firm offers 80 hours of extra paid time off and catered dinners during the busy tax-preparation season. Flexible hours during the quiet season allow employees quality time outside of work. An annual retreat where employees can give input on how to make the company better keeps employees engaged. “There is no hierarchy here and everybody treats each other with respect” is how one staffer describes the culture at this Portland law firm. One junior attorney describes how a “great support system” and attorneys willing to act as mentors makes all the difference. This staffing company promotes work-life balance by offering five-day sabbaticals every five years, compressed schedules and the ability to choose multiple start times so employees who commute can avoid traffic. Reimbursements for gym memberships and scholarships for children of coworkers are welcome additions. Flexible work schedules and telecommuting are efforts this Roseburg accounting firm makes to keep employees happy. Staffers appreciate the opportunities to grow in their roles and the chance for promotion. Most employees can pursue any career path that interests them, says a staffer. If an employee has health insurance covered outside of the firm, this Portland financial planner will automatically direct the money it would have spent to the employee’s 401(k) plan. A “director of compassion” holds training on mindfulness and empathy. One percent of revenue is given to philanthropy. Employees are encouraged to volunteer 20 hours annually using paid time off. Quarterly training on subjects such as diversity, personal finances and mindful eating round out this advertising agency’s employee growth goals. Monthly cellphone allowance, tuition reimbursement and donation matching are welcome additions. An inclusive workplace culture is how one employee describes this Portland tech company. A caring atmosphere and leadership that “understands the balance between work, personal and life events” makes workers feel at home. “Great culture with ability to influence my role and project outcomes,” says a satisfied employee. Solid on-the-job training for new recruits and a strong teamwork ethic are what make this Medford physical therapy provider a great place to work. “Everyone is like family and has supported me through the best and worst times of my life,” says an employee. A healthy workforce is key to the mission at this Beaverton consultant. The company, provides fruit in the office and has a Workout Wednesday where employees end the workday going for a walk or run. Family outings to sporting events, company picnics and community events contribute to an easygoing office culture. It is one big happy family at this Hillsboro cannabis grower. Employees appreciate that managers don’t micro-manage. Company outings, events and wellness days keep the team relaxed and happy. “Our management team is always there with their ears open for you,” says one staffer. “Everyone has a voice” is how one staffer sums up the democratic culture at this Portland tech firm. A lack of micromanaging is a big plus. “I’m given freedom to explore solutions to problems and drive changes.” The focus on work-life balance has broad appeal among staff. Pingpong tournaments add to the fun. A relaxing and casual atmosphere at this civil engineering firm helps make employees feel at home. Staffers respect the owner and managers for their open-door policies and willingness to listen to suggestions for improvement. Events such as barbecues add to the sense of teamwork. A more complete version of the list, including a breakdown of workplace category scores and links to job/career pages, can be purchased here.